I really enjoy mindful, aimless wandering. Adopting a slow pace, being inquisitive, patient and attentive, using all my senses to really get to know my surroundings, and snapping happily away at anything that takes my interest. 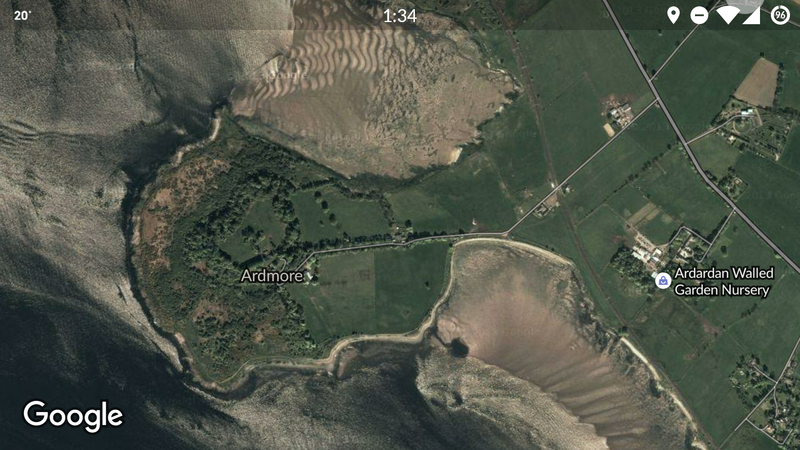 One of my nearby “patches” that I visit regularly and have tweeted often about is Ardmore Point, a delightfully compact peninsula that has island-like qualities and a pleasant, circular walk around the perimeter. It’s location on the Firth of Clyde means that Ardmore is surrounded by tidal estuary and sandbanks (as well as a shipwreck – see my photos on Wikipedia! 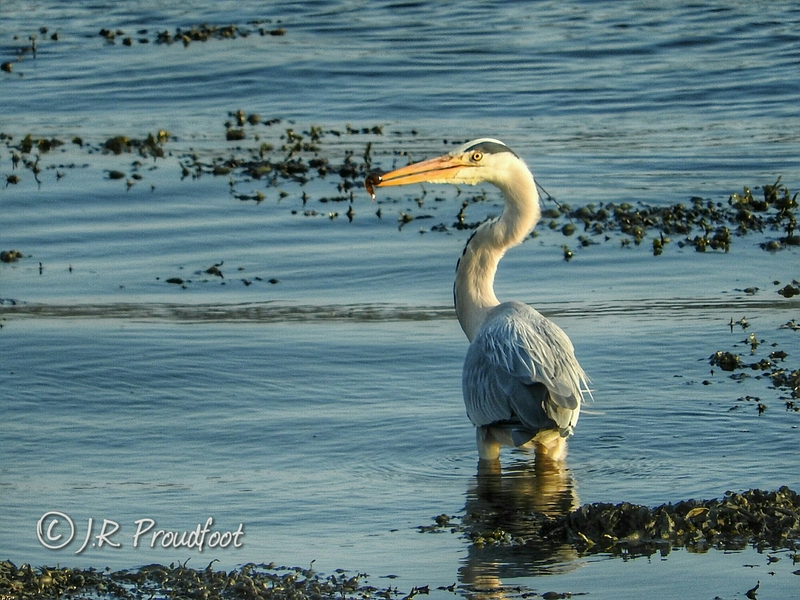 ), so it is an important ecological refuge for birds and other creatures that rely on exposed mud flats and salt marsh. The area is a designated Site of Special Scientific Interest for its natural diversity and importance to breeding birds such as curlew and oystercatcher. It is also a site of geological interest due to its position, balanced on the tectonic fracture line of the Highland Boundary fault. 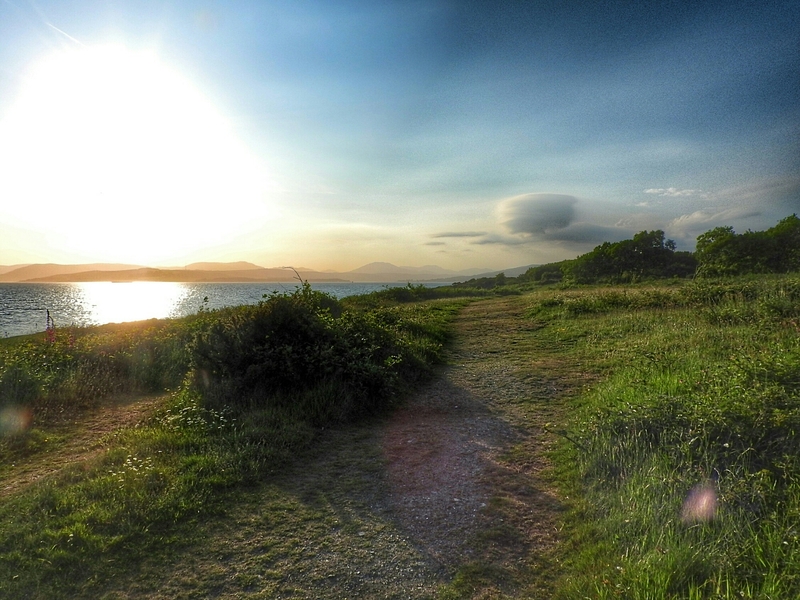 Late summer evenings are a great time to visit Ardmore. The shores and hedgerows are teeming with life, and the dense, dark, forested interior offers a refuge for larger denizens. Deer and rabbit often burst from the bracken as you wander round, and the birdsong and cackles from the rookery can be quite loud. 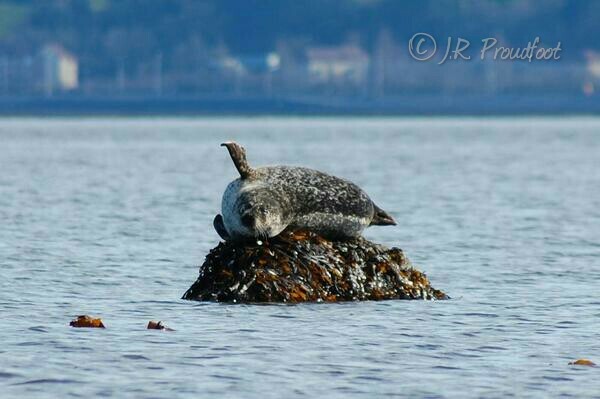 There are ducks, waders, gulls, tern and cormorant, and if the tides are right you can usually find seals sunning themselves on the rocks, like this happy chap. 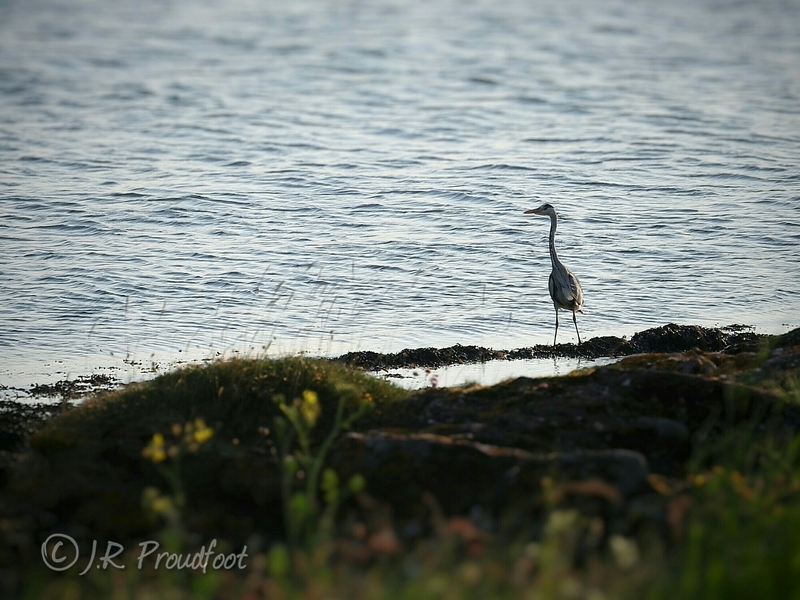 There are always heron, and if you walk quietly enough you can watch them fish. 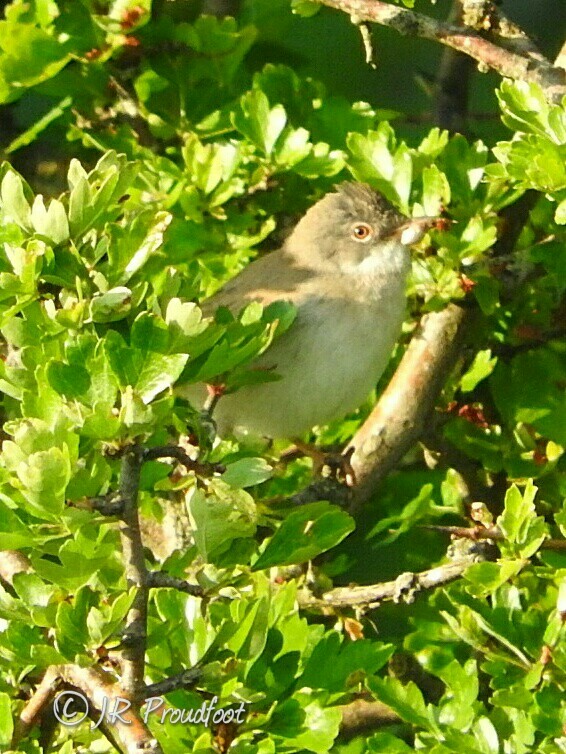 Ardmore is an excellent place to spot summer migrants, and last night I was thrilled to get my first good look at a whitethroat during my walk. It was very busy collecting insects, so it seemed likely that it was nesting nearby. The theme for Ardmore just now is one of purple and yellow. Wildflowers in these colors are abundant at the moment, and are a real treat under the expanse of blue summer sky. 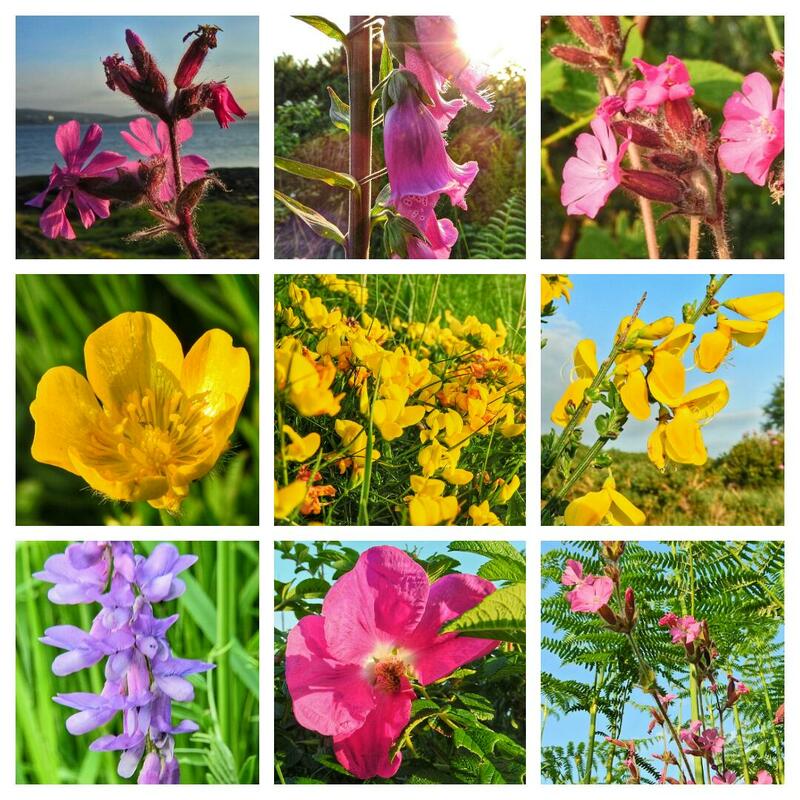 Yellow-flowered buttercup, kidney vetch, flag iris, gorse and broom mingle in the bracken and grasses with the purples and pinks of foxglove, wild rose and red campion. There’s something remarkably restorative and calming about engaging the senses on walks like these, yet also exciting and enervating. Simple pleasures like picking a leaf and crushing it to sample the green scent, the sound of the tide rushing over sand and shingle, or feeling the texture of sun-dried lichens on an old crumbly wall that smells of warm stone. Much as I enjoy ranging without purpose, sometimes I also like to have a little bit of a quest or mission. This can be anything, from trying to track down a new or familiar creature in the garden, to being in the right place to enjoy a sunset, to longer, planned trips up mountains, kayaking or visiting Western isles for natural spectacle. The wonderful thing about the sunny weather we are having just now in Scotland is that it’s actually possible do do some planning, and I’m hoping to make the most of the continued sunshine with some aquatic adventures!